In addition to our concert band, who meet on Monday nights, and the intermediate band (Brass Wind & Fire), who practise on Wednesday nights, in the past we have run training courses for beginners. Plans are now being finalized for the next season, which will run weekly on Wednesday nights as a separate (hour) session, followed by the opportunity (if desired) to join the band for the second half of their session – initially as observers, but as the course runs on, there’ll be an opportunity to join in and play some of the pieces. No prior knowledge or experience (apart from a working pair of ears, and, ideally, an instrument) will be required. There is a limited stock of instruments for loan, first come first served. More details will be on this website soon – if you want to express an interest, do drop us a line at our email address, linked below. We hope to start the sessions in January 2019. Thanks from the band for the warm welcome we received at last Saturday’s show – the first time we’ve ever followed a Fancy Hat competition. Our luck held out for a second year of playing this show, which is out in the open – what rain there was came after we’d finished our set. In addition to those already in the diary, we have a confirmed concert at Deerhurst on Saturday 8th Dec, 2.30pm baton down. Thick pencil in the diary for this one. We have an enquiry about a possible performance in Wells on another Saturday in December – again, please listen out on Monday evening! More details when we have them. Please pencil in a possible engagement on Sunday 16th September, in the Portishead area. 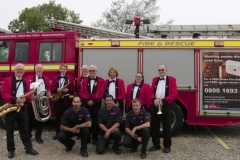 This will be a public performance, for the Fire & Rescue Service. Details yet to be confirmed – keep listening on Mondays! Thanks to everyone who turned up at Soundwell Church last month to hear the band play, with proceeds in aid of their adopted charity. 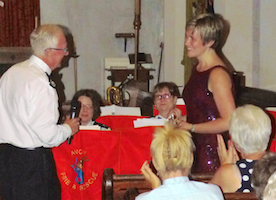 It’s always good to play to a full house, and we were able to give the audience a ‘little extra’, with the presentation of our annual award (the Jim Churchill cup) to Yvonne. (She’s wearing the glitzy number for her vocal number, not the presentation – which was a surprise to her). Thanks to all who came to see the band at Soundwell last week, at our concert to help raise funds for the event and its charity. A fuller report will appear here soon. Thanks too to band members who attended the AGM on Monday – more on this too, to come. Hot on the heels of the concert on Thursday 5th comes the highlight of the year, the band AGM, which is on Monday 9th July, at Lansdown. Open to members of all bands, with an opportunity to play along with the usual Monday crowd’s rehearsal. This is your opportunity to have your say on the organisation of the band, find out what happened in the last 12 months, and vote in next year’s committee (and maybe even put yourself forward in a role). currently Chair of the Band committee. 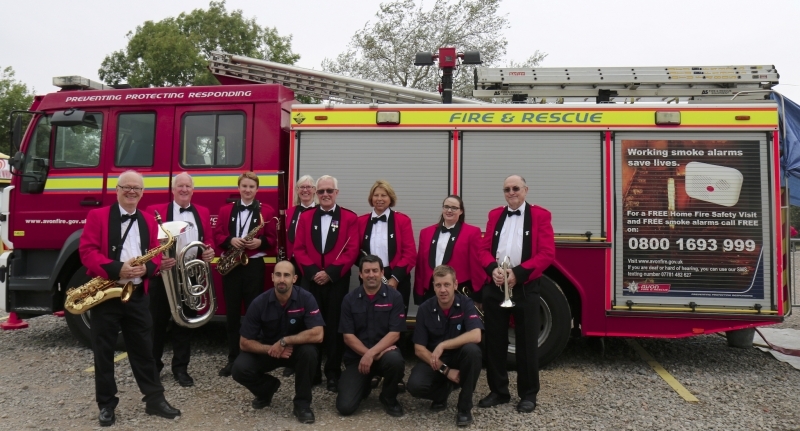 On Thursday, July 5th, the concert wind band will be playing in aid of a local charity at St Stephen’s Church, Soundwell, Bristol, BS16 4RH. The concert starts at 7.30pm, with doors opening at 7.15. Tickets on sale at the door.